Premium grade die-cast combo features EXIT sign with LED lamp heads housed beneath it. Meets UL924, NFPA 101 Life Safety Code, NEC, OSHA, local and state codes. • Red LED has long life and is energy efficient. LED lamps are ultra bright white and high performance premium grade. • NiCd battery has a 8.4V long life, is maintenance-free and rechargeable. 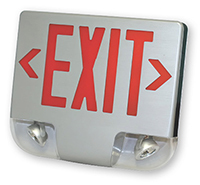 • Includes 2 directional chevrons, face plate closure and mounting for top or end mount. Additional options for remote capability, battery backup, double face conversion and black/white face plate available. Good price compares to other companies. It is pretty easy to install and looks nice. few things I am not satisfied are 1) shipping was not on time (one day delayed), and 2) mine doesn't have the arrows like the picture (maybe it was one of the options, I'm not sure). SimplyExitSigns: Sorry you were not completely satisfied with your shopping experience. We'd like to inform you that a three day shipping means shipping after the sign has been printed. Since it took a day to print the sign, it reached you in four days of your placing the order. Regarding the missing arrows on the sign, please send us a picture and we'll gladly help you out.